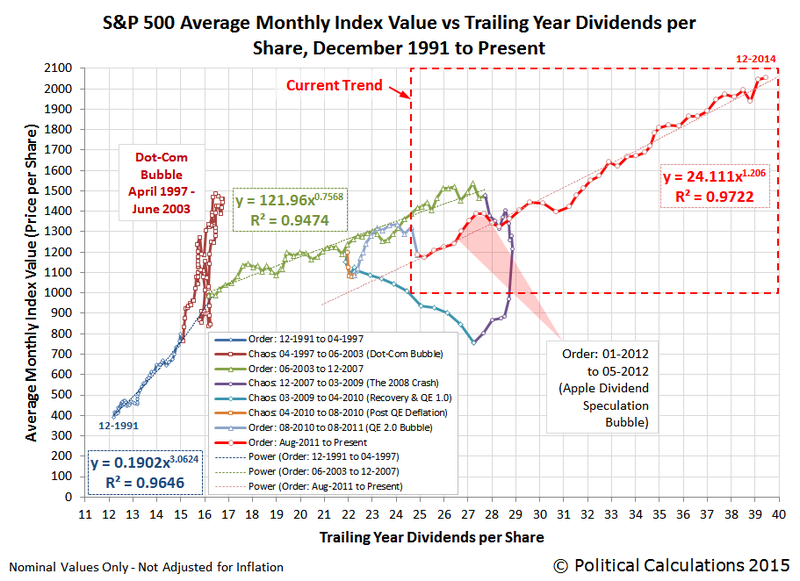 Note, first that returns were good but not stellar after a brief recovery in 2003. 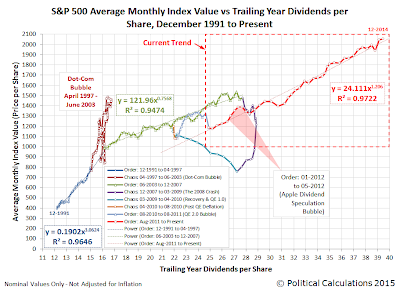 Political Calculations notes that both equity prices and dividends were growing stably right up to the end of 2007, even as profits were falling and GDP growth was weakening. In fact, dividends and buybacks were both strong. American corporations were a significant source of liquidity. Powerful sources of demand could scale up their investments, unlike in the owner-occupier housing market. Plus, corporations were (and are) very deleveraged. Debt to equity ratios are half what they were in the 1970's and 1980's. And, corporations have extensive overseas operations and sales. These were large sources of liquidity. Additionally, investors were tapping margin debt by late 2006 and 2007. As we moved from 2007 to 2008, short positions were spiking (noted by Credit Balances in Margin Accounts). Firms were holding up operations with sources of credit and foreign cash. And, to a certain extent, some of that credit was coming to investors in the form of dividends and buybacks. This is what frightens me about talk of the Fed focusing on financial stability and macroprudential management. This debt was a sign of tight monetary policy. A shortage of money was pulling down nominal asset values and nominal production. Without cash, firms and households will use credit. What are they supposed to do? Unfortunately, our economy still has a significant number of very serious imbalances that need to be resolved before it can grow at a healthy pace. Just to list five. First, the leverage issue of both the financial and the household sectors. Second, wealth–income ratios are well below normal, and therefore more saving is needed to rebuild those ratios. Third, we have dramatic fiscal imbalances, which have to be reconciled at some point. Fourth, we have current account imbalances, which are at least temporarily down, but the Greenbook forecast for the medium term is that there is probably some worsening in that dimension. And fifth, as a number of people mentioned, the unemployment we are seeing is probably not mostly a temporary-layoff type of unemployment. All five of these problems either would be solved by monetary expansion, were caused by the previous disastrous monetary tightening, or both. Yet, Bernanke seemed to be under the impression that these issues either rendered monetary policy powerless or made monetary expansion dangerous....in April 2009. These ideas that somehow, on an aggregate level, we have to pay for past excesses, or that if the financial industry gets an extra dollar, they will somehow drive us off a cliff in a rabid binge of greed and predation, or that we weren't as wealthy as we thought we were, are so dangerous. We were exactly as wealthy as we thought we were. Those houses we were building weren't pretend. There are debates about the problem of national debt, and whether it isn't a problem because we "owe it to ourselves." That is a whole bag of worms. But, if we look at the funding of national production, we really do owe it to ourselves. This idea that we will somehow overproduce if we have too much cash, and somehow end up poorer for it, seems to me to create many more problems than it solves. American corporations own a tremendous amount of foreign production, which is also consumed abroad. We earn such high profits from those operations, that foreign savers have to sell us billions of dollars worth of imports each year and invest the proceeds in the US, just to keep from falling further behind than they already are. We do not, in the aggregate, have a financial stability problem. If the problem is that we shouldn't have so much debt and real estate, then the solution is in tax reform and monetary accommodation. The solution surely isn't liquidity starvation. To a central banker, everything looks like a liquidity problem---as in too much money circulating. This strikes me as a sociological problem. We're out of our ever loving minds.